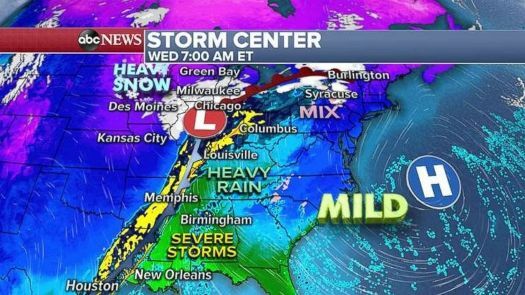 A large storm that developed in the central U.S. is moving east on Wednesday and bringing snow, a wintry mix, severe weather and flooding rain. he storm dumped over 17 inches of snow in the mountains of Colorado, and widespread 2 to 4 inches of snow from the Colorado Plains to the upper Midwest. Freezing rain also was reported in parts of Iowa, Illinois and Indiana on Tuesday night. Locally heavy snow is moving through parts of the Midwest, including Cedar Rapids, Iowa, and Milwaukee, Wisconsin, on Wednesday morning. In Chicago, a wintry mix, with some snow, is possible as colder air is being wrapped into the storm. However, most of the frozen precipitation will stay north and west of the city. A dangerous morning commute is likely in these areas. Additionally, a wintry mix is likely across parts New York state Wednesday morning as precipitation is interacting with colder air. There are numerous alerts being issued for this wide-ranging storm, including winter storm warnings and winter weather advisories from Kansas to Michigan to Maine. Since there is a threat for heavy rain in the Northeast, there are new flood watches being issued for the major cities, including New York, Philadelphia and Washington, D.C. Additionally, there are alerts being issued for blowing snow in the Northern Plains in the storm’s wake. A line of very heavy rain will extend through the Mississippi and Tennessee Valley late in the day Wednesday. Additionally, severe weather is likely across parts of the Gulf — from New Orleans to Mobile — where damaging winds and brief tornadoes are possible. Since this cold front is very strong, it will also cause gusty winds over 35 mph in spots. Out ahead of the cold front, very mild air will surge up the East Coast. Temperatures will be 10 to 20 degrees above average in the New York City area, where temperatures might be in the mid-50s Thursday morning. But the warmth will be brief. Early Thursday morning, the heavy rain and strong winds will move into the southeast U.S. and toward Atlanta. By Thursday morning, the line of heavy rain, with some locally strong thunderstorms, will stretch along the entire East Coast. Very heavy rain will fall Thursday during morning rush hour in the major northeast cities. Locally, 1 to 2 inches of rain could cause flash flooding and strong gusty winds are possible. An additional complication in parts of the Northeast is that the heavy rain, combined with mild temperatures, will cause last week’s snow to rapidly melt and cause additional flooding concerns. Behind this storm, another frontal system will pass and deliver a cold blast. Wind chills on Friday in the Midwest will dip locally to minus 30 degrees. Chicago will feel like minus 21 on Friday morning. Some of this cold air makes its way east, but moderates before reaching the major Northeast cities. It will not be as cold as last weekend. However, another powerful blast of cold air will come in behind it over the weekend and wind chills approaching minus 50 are possible in parts of the upper Midwest by Sunday. Duluth will feel like minus 47 and Minneapolis like minus 29 on Sunday morning — this is life-threatening cold. Next Next post: Where Is Earth’s Submoon?